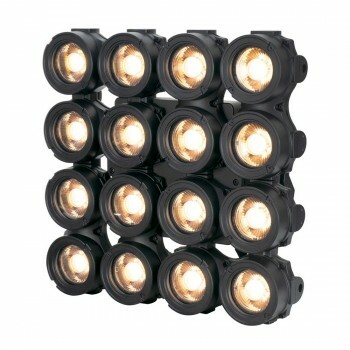 CUEPIX 16IP DTW - Effects - Products - Elation Professional B.V. The CUEPIX 16IP DTW™ is a powerful IP65 outdoor rated effect panel luminaire that features a 4x4 array of 16x40W DTW COB LEDs, 22° beam and 42° field angles, full pixel control and 16-bit dimming, variable dimming curve modes, high speed electronic shutter and strobe, adjustable LED refresh rate and gamma brightness for flicker free operation for TV and FILM, no fans for noise-sensitive applications, DMX, RDM (Remote Device Management), Kling-NET, and Art-NET protocol support, IP65 rated 5pin XLR, RJ45 etherCON, and power in/out connections, full color 180° reversible LCD control panel, and a multi-voltage universal auto switching power supply (100-240v). Versatile rigging options include 90° adjustable and fixed yoke brackets with 3-position mounting holes, and integrated alignment pins and interlocks for multiple panel matrix designs. Optional ¼ turn omega brackets available.